So I got a book in the mail today, which I immediately knew would be a crochet book because it came from the company from which I had ordered my cardigan crochet book. 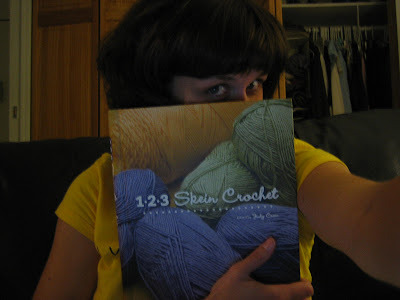 They enclosed a bill for like $30 bucks for this book "I ordered" called 123 Skein Crochet. Learn more about it, and buy it on Amazon here... for $13.57! Dudes, can I just say, I have a really bad memory, but I totally did NOT order this book. I mean, I know I kind of black out sometimes and wake up buried in Etsy goodies and sale Anthropologie accessories, but I KNOW I did not order this shiz. That is my story. And I am sticking to it. Slash, if they send me another bill I will probably definitely pay it. If they send you another bill return it. By then you will have gotten all the use you need from it, and if you decide you want to keep it, buy it from amazon for half the price. Brilliant! They will only know you have it if you admit to having it. I would say..I dont know what you are talking about and I never got anything.